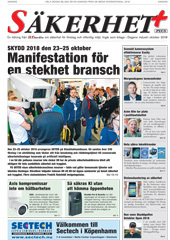 The next issue of Säkerhet Plus will be released in the middle of November 2019 and distributed as a supplement to Dagens Industri (The Industri Today - a major Swedish magazine). In this magazine we present everything that concerns Security within private and public organisations. This could be anything from guards, locks and access systems to intruder and fire alarm. We also expose solutions to IT Security problems. Säkerhet Plus is the optimum media for Security companies that want to present themselves to large groups of people within private, communal and state administrations. An ad in Säkerhet Plus will reach those that ordinarily don't read Security publications but none-the-less are potential customers. Material dead-line: 23 October 2019. The ads can be created traditionally or with an editorial touch in the shape of, for instance, an article presenting a company. The ad size is specified as width x height. If you would like another format it can be arranged - please contact us. VAT is added to the prices above. Advertising material: Digital. Valid complete materials are locked files in PDF (print optimised). Format: The printing roller size is 524x358 mm. This means that the paper can not be printed completely, there will be some empty space on all sides. The rules for supplements state that there must be a heading clearly indicating that it is an ad supplement and nothing else. Paper: Pink News 42,5 g (the same as The Financial Times). Article information: In order to get a uniform layout the same font is used in all articles. All editorial ads resembling a journalistic report are produced by AR Media. We expect to receive drafts and pictures. Max 4000 characters including spaces / half page. The production of the article will be charged the actual cost. AR Media need one PDF which includes all the fonts and pictures with high resolution. ALL files must be named with the Clients name.